New Delhi : Exit polls on Friday predicted a Congress sweep in Rajasthan and a Telangana Rashtra Samithi (TRS) win in Telangana while giving the Congress an edge over the BJP in a fiercely-contested battle in both Madhya Pradesh and Chhattisgarh. The surveys predicted that Mizoram, the only northeast state now with the Congress, may see a hung Assembly. 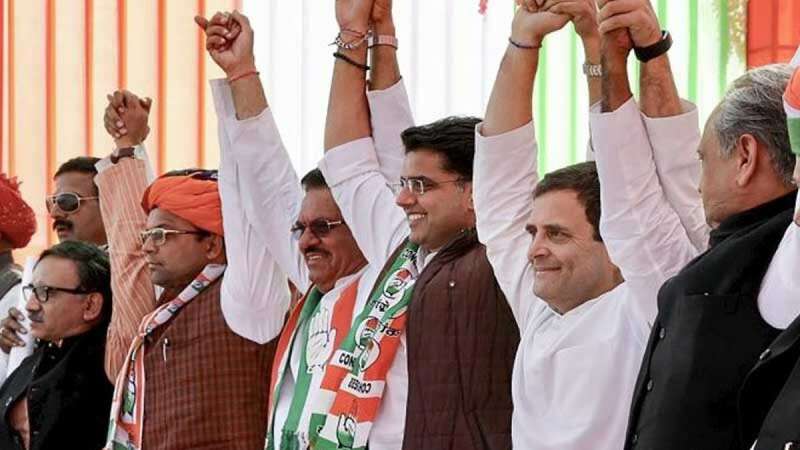 Surveys by media organisations and agencies predicted a Congress victory in Rajasthan, continuing a trend in a state that has not re-elected the party in power for a second term in the last 20 years. In the 200-seat Rajasthan Assembly, the India Today-Axis My India survey gave the Congress 119 to 141 seats with a vote share of 42 per cent. The BJP was poised to get 55-72 seats with a 37 per cent vote share. The Republic TV-CVoter predicted that the Congress would get 81-101 and the BJP 83-103 seats. The Times Now-CNX survey forecast that the Congress was likely to win 105 seats and the BJP 85 seats. The BSP could get seven seats. A survey by News24 gave the Congress a clear majority (110-120 seats) with the BJP likely to win 70-80 seats. In 2013, the BJP won 163 of 200 seats. The Congress finished a distant second with 21 seats. In Telangana, the exit polls predicted that the ruling TRS will retain power and the gamble by Chief Minister K. Chandrashekar Rao to dissolve the Assembly ahead of schedule may have worked in his favour. According to various surveys, the Congress-led People's Front will have to sit in the opposition in the Assembly. The Congress had stitched an alliance with the Telugu Desam Party, the Telangana Jana Samithi and the Communist Party of India to take on the TRS. India Today-Axis My India exit poll predicted that TRS may win 79 to 91 seats in the 119- member Assembly while the Congress-led alliance may get 21 to 33 seats. The All India Majlis-e-Ittehadul Muslimeen (AIMIM) may end up with 4-7 seats and the BJP 1-3 seats. The Times Now-CNX survey predicted that the TRS may win 66 seats and the Congress-led alliance 37 while the Republic TV-CVoter claimed that TRS would win 48-60 seats, Congress 47-59, BJP 5 and others 1-13 seats. TV9 Telugu-AARA predicted that TRS may win 75-85 seats, Congress 25-35, BJP 2-3 and others 7-11 seats. However, NewsX-Neta predicted that TRS would emerge as the single largest party with 57 seats, three short of the 60 needed to form a government. It claimed that the Congress alliance may get 46, BJP 6 and others 10. Exit polls in Madhya Pradesh and Chhattisgarh, the states ruled by the BJP since 2003, indicated a close contest but an edge for the Congress. A majority of exit polls predicted a Congress victory in Madhya Pradesh. ABP News-Lokniti CSDS survey gave the Congress 126 seats, BJP 94 and others 10 in the 230-member Assembly. India Today-My Axis poll too gave the Congress an edge (104-122 seats) and the BJP 102-120 seats. It predicted 1-3 seats for BSP. C-Voter predicted a Congress win in 110 to 126 seats as against the BJP's 90-106 seats. Other parties are likely to win 6 to 22 seats. As per iTV-Neta exit poll, the Congress may win around 112 seats and the BJP 106. Other parties, including BSP, could win around 12 seats. However, Times Now-CNX poll gave the BJP the upper hand with 126 seats and 89 seats for the Congress. In the 230-seat Assembly, a party needs 116 to form a government. In 2013, the BJP won 165 seats, the Congress 58, BSP four and Independents won three seats. In Chhattisgarh, the Congress is likely to get enough seats to form a government, a majority of exit polls said. But some predicted the BJP would retain the state. According to India Today-Axis My India, the Congress would bag 55-65 seats in the 90-member Assembly, reducing the ruling BJP to 21-31 seats. Republic-C-Voters gave the Congress 40-50 seats and the BJP 35-43 seats. But Times Now-CNX and ABP News-CSDS forecast that the BJP would retain power for a fourth straight time. The former projected 46 seats for BJP and 35 for the Congress while the latter saw BJP's victory on 52 seats and that of Congress on 35. News Nation predicted 40-44 seats for Congress, 38-42 for BJP and 4-8 for the alliance of former Chief Minister Ajit Jogi-led Janata Congress Chhattisgarh (JCC) with Mayawati's Bahujan Samaj Party (BSP), which can play a role of the kingmaker in the event of a split verdict. News24-Pace Media exit poll said the Congress would emerge the winner with 45-51 seats while the BJP would settle for 36-42 seats. In 2013, the BJP formed the government after wining 49 seats. If the exit polls are to believed, Mizoram may have a hung 40-member Assembly. As per CVoter, the ruling Congress is likely to get 14 to 18 seats and the Mizo National Front (MNF) 16-20. It has predicted 3-7 seats for the Zoram People's Movement (ZPM). According to India Today-Axis My India, ZPM may dent both the MNF and Congress in the state. According to Times Now-CNX, the MNF will win 18 seats and the Congress 16. The exit polls by Republic-C-Voter showed the MNF getting 16-20 seats. The exit polls were announced after polling ended in Rajasthan and Telangana on Friday. Polling was held earlier in Madhya Pradesh, Mizoram and Chhattisgarh. The results of all five states will be declared on December 11.